The Prudent Life: What does "prudent" mean, anyway? What does "prudent" mean, anyway? I got to thinking that my blog title probably doesn't aid my presence in the online world. Who wants to be known as prudent? Isn't the term "prude" just a shortened term of this word, anyway? I even contemplated changing the name of my blog. But then I remembered something. 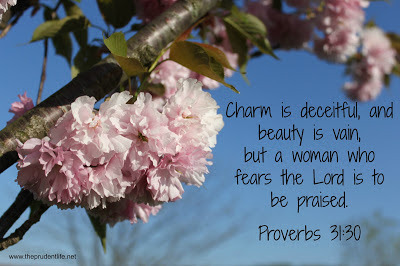 Prudent is the perfect word for how we are to live as wives and moms. As wives and moms, isn't this exactly what we are supposed to be? I think of the Proverbs 31 woman and how industrious and incredibly practical she was (take a moment to read it, if you don't remember). Being a godly, prudent wife and mother isn't all that glamorous, but it is what we are called to be. And the rewards are tremendous. I keep having to remind myself of that, when I am in the trenches of it. Sometimes it is just downright hard. Judging by these verses, prudent is exactly what we should want to be. And so...after giving it some thought, I am going to keep my blog title. God calls us to live wisely and carefully, never leaving down our guards or giving up. We are called to live a Prudent Life.